Food Concepts commenced operations in 2001. From inception, our aim has been clear-cut and focused: to revolutionize the food sector in West Africa and to deliver extraordinary satisfaction to our stakeholders. The journey began with our pioneering of the food court concept in Nigeria – a new and exciting offering for the local market. At the same time, we also imported well-developed QSR (Quick Service Restaurant) brands from South Africa. Since this time we have concentrated on developing our own brands, which already occupy prime market positions. Chicken Republic, as our flagship brand, is a classic success story. Food Concepts is a leading firm in the West African food industry with a basket of top brands including Chicken Republic, Butterfield Bakery and Free Range Farms. The company has 1,500 plus employees in Nigeria and has operations in Nigeria, Ghana and South Africa with diversified businesses in Food, Entertainment Properties and Poultry. Food Concepts started implementing Oracle E-business suite R12 with the main objective to integrate all the locations, enable operations visibility and incorporate industry best practices by bringing together its operational and accounting systems while reducing the deployment time, operational inefficiencies and inaccuracies. 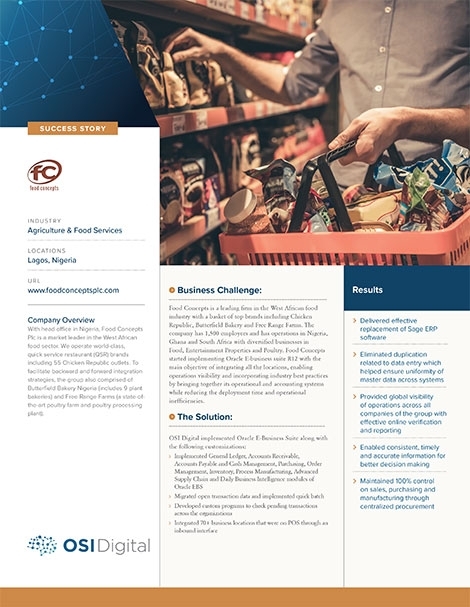 OSI Digital helped Food Concepts maintain 100% control of sales, purchasing and manufacturing through a streamlined and centralized procurement system. OSI provided Food Concepts with global visibility of their operations along with effective online verification and reporting.